A herd of 34 bison, pure of any cattle genes, have been introduced from Yellowstone National Park to the Fort Belknap Indian Reservation in northern Montana. A red pickup rolls into a 1,000-acre pasture of dry grassland on the Fort Belknap Indian Reservation in northern Montana. Mark Azure, director of the reservation's fish and wildlife department, is out looking for buffalo when he spots about two dozen of the furry beasts gathering around a watering hole. The animals are "grazing, wallowing, drinking, checking us out," Azure explains. He says the tribes have been working to see these bison here for years. "This is their home, this is where they came from," he says. This small herd of 34 genetically pure bison is roaming northern Montana's high plains for the first time since being nearly hunted to extinction in the 1800s. The animals come from Yellowstone National Park, home of the last bison known to have no trace of cattle genes. The Fort Belknap Indian Reservation received them through a deal with Montana wildlife officials. Tribes are hailing the arrival of the bison as a return of something lost and a cause for celebration. But others see the animals as an intrusion. Leta Calvin, a tribal member who lives at the base of the hill, across the highway from the bison enclosure, owns a small cow-calf operation with her husband. She worries the bison herd, enclosed behind an 8-foot, woven wire fence, could harm her livelihood. "[If] people find out that we have the cattle here and the bison are next to 'em," she says, "people are gonna be less apt to buy our calves." That's because of the disease brucellosis — or the fear of brucellosis. It runs in bison and can cause cattle to abort their calves. The illness can pretty much ruin a rancher's business. These bison, though, have been tested over and over again for years and do not have brucellosis. But Calvin says that doesn't matter — it's the perception that they might. "People around, they're not gonna listen to all that," she says of the test results. Mike McCabe, a tribal member who owns a dusty piece of land on another side of the bison enclosure, is also concerned about the new arrivals. He says he's "not confident in that fence at all. ... I'm a poor rancher as it is." 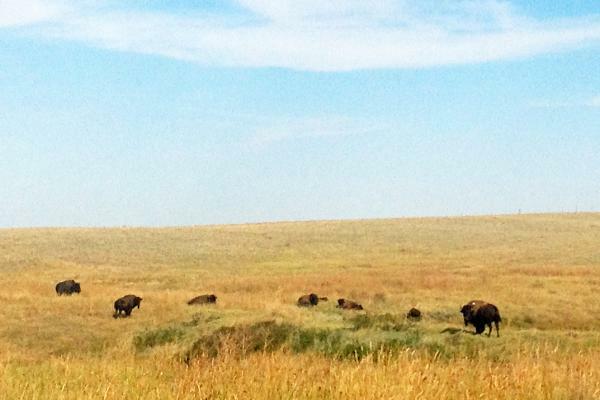 Fort Belknap already has a herd of hundreds of bison with a small trace of cattle genes. Landowners like McCabe, who surround these other herds, have complained for years that the reservation does not properly care for them. They break out, they say, damaging private property and eating hay. McCabe worries the same thing could happen with the new genetically pure bison. "If they're starving, I can almost imagine they're gonna try to get through there somehow," he says. The reservation cut a deal with the state for the pure bison, and if state officials determine the tribes are not taking good enough care of them, they can be taken away. Tribal officials say they will not let that happen. Back inside the pasture, Montana State Rep. Clarena Brockie, a Native American herself, is watching the bison gather around the watering hole. When they disappeared from these lands generations ago, she says, so too did many tribal ceremonies and much native culture. "These are the same bison that were with my ancestors, that helped my grandparents and my ancestors survive," she says. The tribes and the state will be letting the herd grow over the next few years. At that time, the reservation will have full authority to decide whether to sell the bison for meat or use them for ceremonial purposes. Copyright 2014 Montana Public Radio. To see more, visit http://www.mtpr.org. Genetically pure bison are roaming the high plains of northern Montana for the first time since the 1800s, when they were hunted to near-extinction. These animals are special. They have no trace of cattle genes. A deal with wildlife officials brought a small herd of them from Yellowstone National Park to the Fort Belknap Indian Reservation. Now, some of the people living closest to the herd are voicing objections. Montana Public Radio's Dan Boyce has the story. DAN BOYCE, BYLINE: A red pickup rolls into a thousand-acre pasture of dry grassland on the Fort Belknap Indian Reservation. Director of the reservation's fish and wildlife program Mark Azure sits behind the wheel. He drives into a shallow gulley, looking for buffalo. MARK AZURE: There they are, right there. BOYCE: About two dozen of the furry beasts are gathering around a watering hole. AZURE: Grazing and wallowing, drinking. BOYCE: He says the tribes have been working for this for years. AZURE: This is their home. This is where they came from. BOYCE: A video on the Great Falls Tribune website shows the 34 Yellowstone bison thundering from a horse trailer into the enclosure, which is surrounded by an 8-foot-tall, woven-wire fence. Crowds watch from truck beds, cheering. Many see this as a cause for celebration. A few see it as an intrusion. BOYCE: Lita Calvin lives at the base of the hill, across the highway from the enclosure. She's a tribal member, and she and her husband run a small cow-calf operation. Calvin worries the bison behind that tall fence could harm her livelihood. CALVIN: People find out that we have the cattle here, and the bison are next to them - people are going to be less apt to buy our calves. BOYCE: Because of the disease brucellosis, or the fear of brucellosis. It runs in bison and can cause cattle to abort their calves. These bison, though, they've been tested over and over again for years. They do not have brucellosis. Calvin says it doesn't matter; it's the perception. CALVIN: People around, they're not going to listen to all that. MIKE MCCABE: I'm not confident in that fence at all. BOYCE: Over on another side of the enclosure, 56-year-old tribal member Mike McCabe(ph) stands out on his dusty piece of land. MCCABE: I'm a poor rancher as it is. BOYCE: Fort Belknap already has a herd of hundreds of bison, bison with a small trace of cattle genes. Landowners surrounding these other bison - like McCabe - have complained for years the reservation does not properly care for them. They break out, damaging private property, eating hay. McCabe thinks the same thing could happen with these genetically pure bison. MCCABE: If they're starving, I can almost imagine they're going to try to get through there somehow. BOYCE: The reservation cut a deal with the state for these bison. If the state determines the tribes are not taking good enough care of them, they can be taken away. Tribal officials say they will not let that happen. STATE REP. CLARENA BROCKIE: This is the first time I'm seeing them. BOYCE: Back inside the pasture, state Rep. Clarena Brockie is watching the bison gather around the watering hole. She says when they disappeared from these lands generations ago so, too, did many tribal ceremonies and so much culture. To have genetically pure bison back on the landscape, to Brockie - as a tribal member herself - that's significant. BROCKIE: These are the same bison that were with my ancestors, that helped my grandparents and my ancestors survive. These are the same bison. BOYCE: The tribes and the state will be letting the herd grow over the next few years; then the reservation will have full authority to decide whether to sell the bison for meat, or use them for ceremonial purposes. For NPR News, I'm Dan Boyce in Helena, Mont. Transcript provided by NPR, Copyright NPR.